Once upon a time, I lived near deserts and I loved them. It was natural, then, that deserts became the living and breathing setting for Sand of Bone. When I was a kid, my grandparents owned a piece of desert property outfitted with a one-room cabin outside Apple Valley, California, on the edge of the Mojave Desert. Apple Valley was a little tiny place at the time – less than a tenth of the population it is now – and for a kid raised in the suburbs of Orange County, it was about as middle-of-nowhere as I could imagine. Our family spent a few weekends every year up there. It being the late 70’s, my parents let me roam the desert at will for hours as long as I promised to never try to catch a snake or explore the abandoned mineshafts. I rarely broke the first rule (though I did watch my cousin catch, and get bitten by, a red racer), and sort of skirted the second rule. I mean, really! I was nine years old, my head was filled with adventure stories, and the mineshaft was right there! Alas, by the time I was twelve, I’d seen some movie about a collapsing mineshaft. That movie did a better job of keeping me out of the mine than any threat my parents made. The stars at night were incredible — glitter strewn on deep blue silk. And I could see at night! I could walk right out the front door and around the hilltop in a dark that wasn’t really dark after all. I didn’t know then it had to do with rods and cones and how eyes adjust to light. So I told myself stories about magic in the land that gave people “desert eyes” – a special ability to see the open desert by starlight as clearly as I could see it by day. As a young adult, I made numerous trips to sites within the Mojave (including the time I tried camping there in August and ended up sleeping in the car wearing nothing but my hiking boots), and high deserts and low throughout the Southwestern United States. Whenever life felt too tight, I longed to head to the desert. It’s hard to explain the magic of deserts to people who’ve experienced them only from a car window on the way from one more exciting place to another. It isn’t barren at all. It is instead completely comfortable with its unfilled spaces. There is freedom in the great openness, a thinness to the air that pulls me forward, a longing to just be still and watch the wind pass its touch from dry grass to grit to jackrabbit ear. The sand atop rock, the spires of dark stone, the painfully blue sky… That’s where the characters do a great deal of living and dying. And in the sequel, Breath of Stone, a very special group of characters exist in a place that looks almost exactly like that photo. 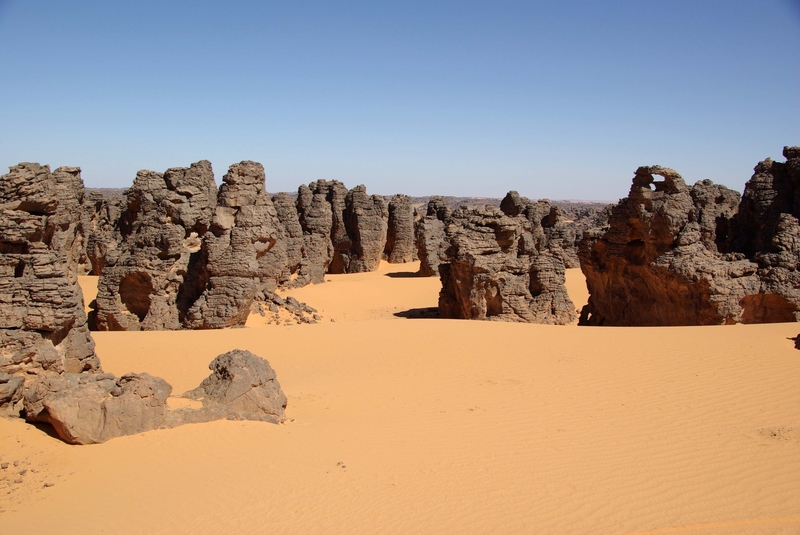 Will you picture the same desert for Sand of Bone as I do? It doesn’t really matter if you do, really. I’d rather you have in your mind the desert that you feel — the open place that will draw you in then leave you to fend for yourself, that will challenge you to expand your limits rather than have mercy for your mistakes, that will tell you being alone is perfectly fine while at the same time proving the importance of community. Because that’s what wild and dangerous places do for us. Remember to sign up for the newsletter that’ll keep you up to date on my upcoming books, convention travels, writing progress and more!